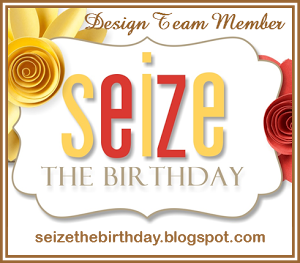 Welcome to Seize the Birthday Challenge for November and the last challenge for us this year. Remember that we take the month of December off. This year has gone so fast, can't believe all of the things that has happened and that I have done. Some new experiences and leanings. But, on with this challenge and Yes, we have a topping. I love doing monochromatic cards and usually think of blue. Not sure why I do that, but for this challenge, I thought blue or more turquoise. Here is my card for your inspiration. I heat embossed this stamp called Bold and Blooming from Gina K Designs, in clear embossing powder on a panel of Ocean Mist Card stock. Next I colored it with Copic marker BG01. At this point, I didn't like what I had done, so I got out my Prismacolor pencils, and colored with the blue. Now I got something. The sentiment is from the same stamp set using GKD Ocean Mist ink. Adding the matching ribbon and jewels to the panel gave it some bling. It was then adhered to a base of the same card stock. I finished the inside with a little more ribbon. Today is Thanksgiving day and I want to wish you all a happy day with your family and friends. I hope that you all have something to be thankful for, I know that I do. Now on to the card that I have for you all today. I like to have a special card that I like to give out at Christmas time, that looks like I took tons of time to make. Our secret, this one didn't take much time at all and only two dies. 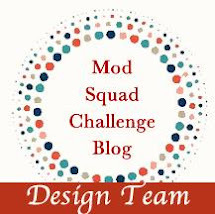 Please check out the Dies R Us Inspirational Blog for the instructions. I'll let you get back to your turkey eating, but thanks so much for stopping by and I really appreciate your comments. Copic marker. Then, what to do with him. Got a brain storm and here is how I fixed him up. Yes, he is peeking out from behind this embossing folder. I colored up the wood panel and then cut sliced in the middle. Curled up the ragged ends and then place the Santa behind it. The rest, you can see. Just more die cuts for the poinsettias and the word die BELIEVE. That's all we need to do is believe in the spirit of Christmas. 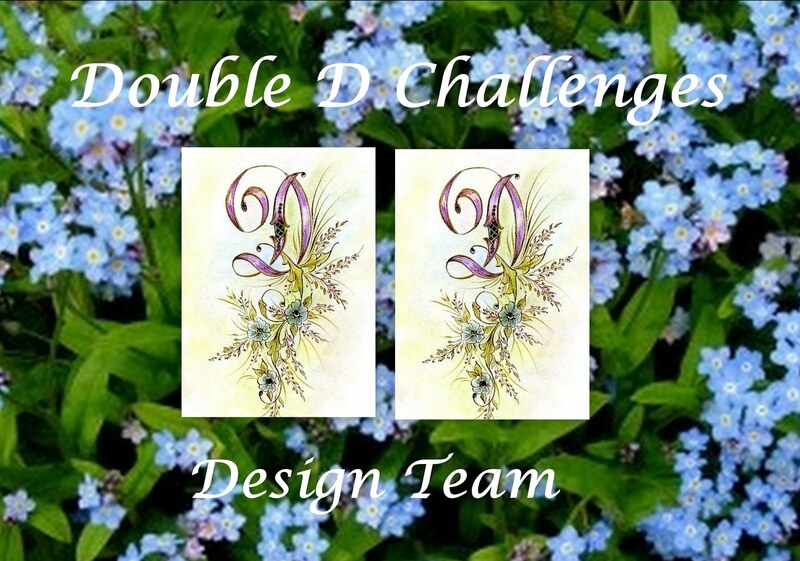 I am entering this card in the Double D Challenge for this week. I am on a roll, that's two challenges so far this week. Just another view. I wanted you to see that I finished the inside. Not sure how I will mail this one. Maybe had it to someone. Hmmmm, who would that be? Thanks for stopping by, I love your comments. Today I am on the Dies R Us Inspiration Blog with this card that I made using dies. It is an easy one to mass produce. But a cute one to send out to your family and friends. please visit the Dies R Us blog. Thanks so much for stopping by, This is a busy time of year and I hope that you have time to do a little card making. Power and Spark - Portion Control! Dear friends, I can't remember when I entered a challenge. It has been so long. I checked out my blog and sure enough, the last challenge that I entered was in July. It was a Power Poppy challenge too. Those of you that know me well, know that lots of things happened in this past year, but my creativity lives on. So when I saw this challenge, Portion Control, I had a little chuckle, having been a lifetime Weight Watcher, I could not resist. Check it out, it was a lot of fun and really pushes your creativity. Here is the card that I completed today for this challenge. I only stamped a part of the set called Poinsettia, a wonderful Christmas flower. Usually, using the entire stamp of the flower gives you a great flower to color up and a fabulous card. But using just a part of this stamp really gave me a completely different look. Here is the part of the stamp that I used. Can you see the part on the lower right? Also used the cluster on the bottom left too. On the right side, I die cut a few stitiched patterns with My Favorite Things dies that I had. It feels good to be back in the business of doing the challenges, as it really makes your juices flow. I think that I needed that. Thanks for stopping by, this was fun and I sure do appreciate your kind comments. They do brighten my day. Hello! 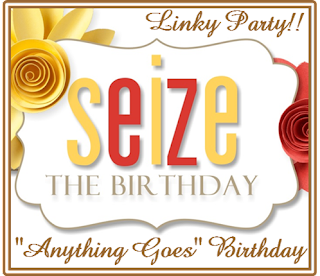 It is time for another challenge at Seize the Birthday. For this challenge we have a topping and it is Circles. I used a lot of circles on my card and here is my example. I decided to make this a wintry looking birthday card, and it is a tri-fold as well. Started with a base for Primitive White card stock from MFT. Then cut panels of Design paper from Recollections 6X6 Noel pack, to decorate the front and inside panels. I also used a Die from MFT called Flop circle card. I cut lots of circles from different papers, both sparkly and plain, and layered then on the front. Added the Wishing form Memory Box dies to the front and had to cut it to fit the tri-fold. Inside I stamp the greeting from PaperTrey Ink, Think Big Favorites #24. I had to close it with a belly band and I put a die on that too from Memory Box called Holly Flourish. 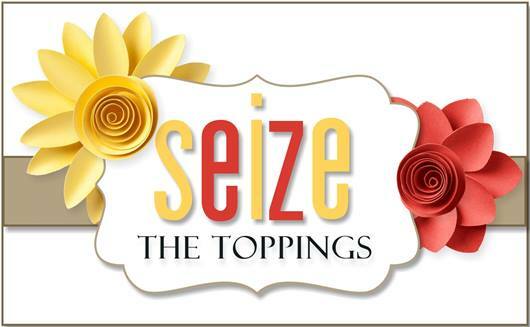 If you are not a toppings kind of person, that's fine. Just make it a Birthday a theme. MSC - Cut it Out! Well, it is not that bad. Chin up, crafters this is a challenge after all. You can make a Christmas card like I did. Here is my example for you. For this card, I started out with Gina K Designs Card stock in Tomato Soup. I stamped the images with Power Poppy stamp, Holly Golightly, using Versamark ink. Then I heat embossed it with gold embossing powder. It needed something more, that is when I used gold stickles on the holly and splatters of gold paint. Lastly, I cut some think strips of gold foil paper and added then to the sides of the front panel . Using matching GKD tomato soup ink, I stamped the holly down the left side of the inside. 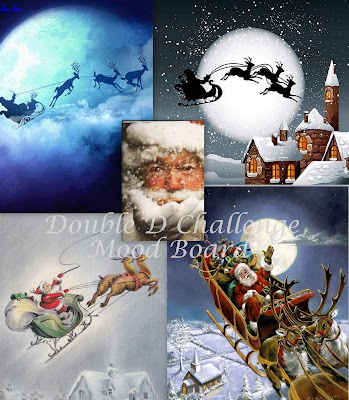 Now let's see what you can do with this challenge. Thanks for your commets, they make my day brighter.